In thinking about sample board and presentation organization, it may be helpful to consider the rule of three. The rule of three is a compositional tool used in photography and the visual arts. This rule can help with the organization design presentations especially where items of differing sizes or scales/points of view are employed. 2. At the very least create an imaginary border of at least ½” around the sides and top and maybe leave a larger open border space at the bottom (this works best if you are going to have a title or title block there). OR rather than using a bottom open space for the title, just use the same dimension you have on the top and bottom and insert the title inside that imaginary border. Presentations will be more well-composed looking if you follow this step (2). 3. 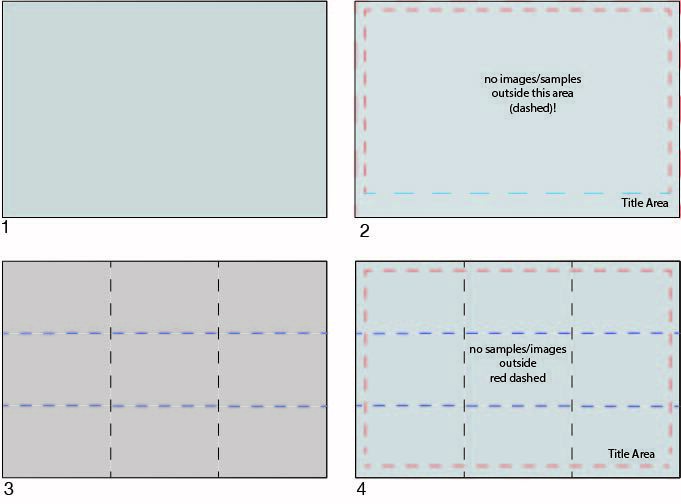 Consider using an imaginary grid that divides the board into a 3 column by 3-row grid and use this grid to lay out samples or drawings (this works whether samples are real or digital). 4. When using the 3 by 3 grid, you can imbed the title into one of the grid sections or include it in a title block along the bottom or side. But in all cases leave that open border of space to serve as a visual border controlling the composition of the board!